U.S. special counsel Robert Mueller's report is now in the hands of the attorney general, and Democrats are clamouring to see more than just a summary of it. The demands are setting up a potential tug of war between congressional Democrats and U.S. President Donald Trump's administration that federal judges might eventually have to referee. Six Democratic committee chairs wrote in a letter to Attorney General William Barr on Friday that if Mueller has any reason to believe that Trump "has engaged in criminal or other serious misconduct," then the U.S. Justice Department should not conceal it. "The president is not above the law and the need for public faith in our democratic institutions and the rule of law must be the priority," the chairs wrote. It's unclear what Mueller has found related to the president, or if any of it would be damning. In his investigation of whether Trump's campaign co-ordinated with Russia to sway the 2016 election, Mueller has already brought charges against 34 people, including six aides and advisers to the president, and three companies. No release without incriminating evidence? Barr said in the letter advising the top lawmakers on the House and Senate judiciary committees on Friday that he had received Mueller's report that he intends to share its "principal conclusions" with lawmakers soon, potentially over the weekend. He also said he will consult Mueller and Deputy Attorney General Rod Rosenstein about what other parts of the report can be shared with Congress or the public. 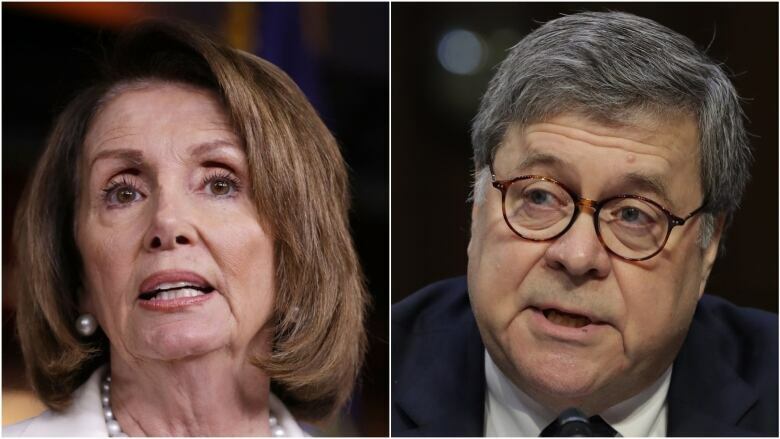 Democratic House Speaker Nancy Pelosi called Barr's offer to release a summary "insufficient" and urged him to release the full report to lawmakers so their committees could proceed with their "independent work." Pelosi also said in the statement that any congressional briefings on the report should be designated unclassified so members "can speak freely" about them." House intelligence committee chair Adam Schiff told CNN on Friday that he's willing to subpoena Mueller and Barr, if needed, to push for disclosure. The Democrats, led by judiciary committee chair Jerrold Nadler, could also formally ask Mueller to send his committee evidence that could be used in possible impeachment proceedings against Trump, as suggested by Benjamin Wittes, a senior Brookings Institution fellow and editor-in-chief of the Lawfare blog. That's the course one of Nadler's predecessors followed during Watergate, although an impeachment inquiry against Richard Nixon had already started by that point. Grand jury material from special counsel Leon Jaworski, provided through the federal judge who presided over the Watergate trials, became the road map that the House committee used to vote for articles of impeachment. Nixon resigned before the full House acted on his impeachment.